Should you buy a cheap stroller for your precious ones? Do you feel that a cheap stroller means a poor performance stroller? If you think so you shouldn’t necessarily leave our page now. Sit back and go through our review. Obviously, your concept will change after reading our helpful information. Keep in mind, it isn’t essential to buy an expensive baby stroller to get the job done safely and comfortably in style. Though, it’s really hard to find out good cheap baby strollers, especially when you’re on a tight budget. But you neither need to break your head in selecting a cheap baby stroller nor to spend hundreds of dollars to get a decent one. We’ve spent a lot of time for you on this issue and find that best stroller are regularly available at a low price, too. We’ve organized the low price, yet good stroller in two categories depending on their price range, under cheap budget thus make the hard job relatively easy for you to choose the quality cheap baby strollers. These strollers are not only great for travel and everyday activity, but also offer safety and comfort to the children and a stylish ride to the parents. It isn’t always easy to find out a cheap stroller that will meet your overall expectations. Still, there are a lot of decent options for a low price. We’ve listed down some budget-friendly stroller here, especially under budget that offer not only solid constructions but also a lot of basic features and the convenience you need. Baby Trend Xcel Jogger Stroller is one of the best jogger solutions for the parents who are the fitness enthusiast and like jogging while don’t want to compromise the time out with their baby. 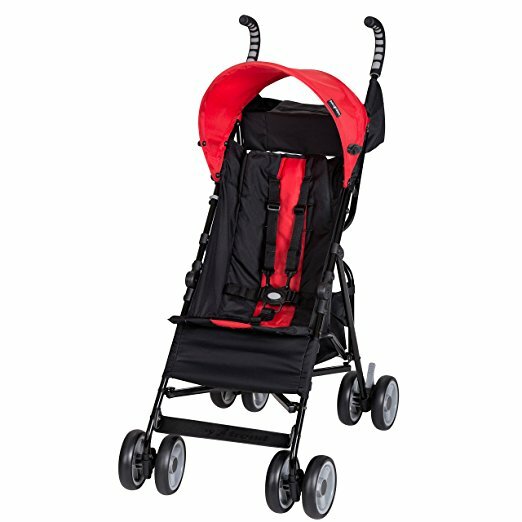 This stroller offers you a convenient way, whether you go on long jogging or walking or shopping. Featuring with all-terrain wheels, reclining seat, five-point harness, footrest reflector, child’s tray, parent cup holder, adjustable canopy, this stroller provides a comfortable and secure ride for your children. The 12” swivel front wheel allows you to lock it into place when you go for jogging. 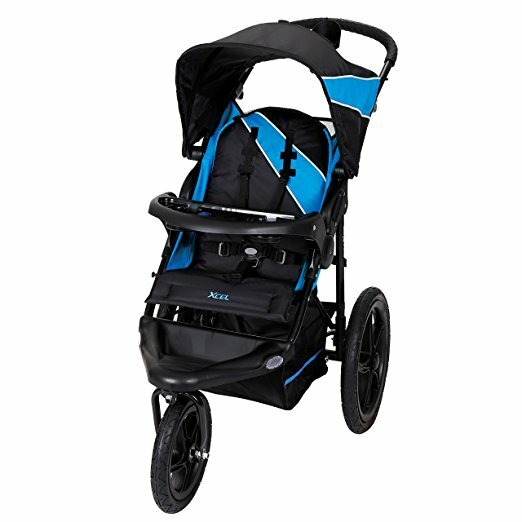 The 16” rear wheel featuring with a parking brake ensures the complete stop of the stroller when need. All these features ensure the stroller’s easy maneuverability on more difficult terrains. All these features make this stroller an ideal solution for busy parents. All these features ensure your baby’s comfort as well as safe riding. 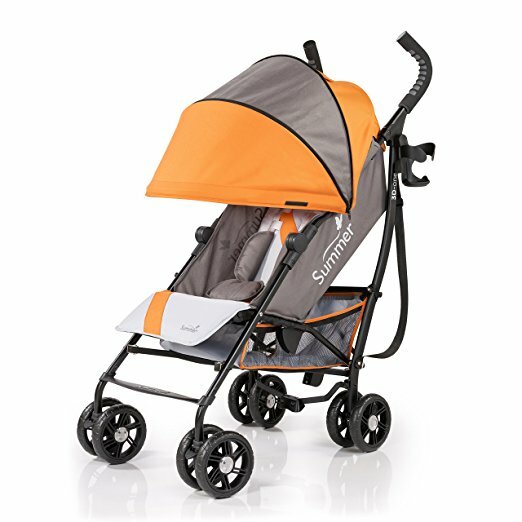 Lightweight, convenient single jogging stroller that you can take everywhere you need to go. The only stroller that you need for you and for your baby. Enjoy an unbeatable performance at a reasonable price. Enjoy all the versatility of an umbrella stroller and traditional stroller with Summer infant 3D-one stroller. Moreover, the 4 amazing one-hand features that include one hand recline, one hand adjustable footrest, one hand fold and one hand adjustable canopy make it the one and only stroller mom will ever need. 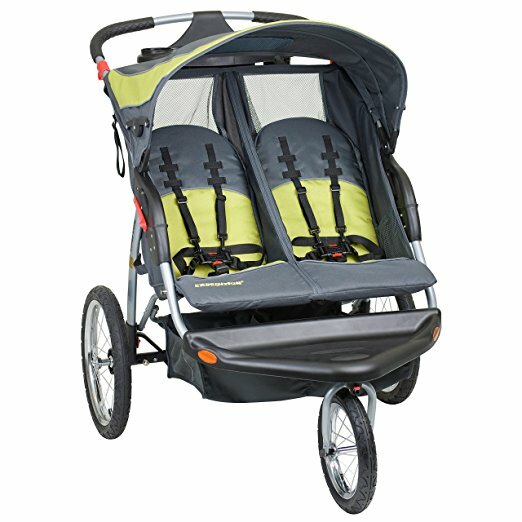 The large canopy provides shaded comfort and full protection from the sun to your little passengers while in the ride. The seat allows you to recline in three different positions (fully upright to completely reclined) toprovide maximum comfort to your baby. The glide front wheels ensures a super smooth ride without bouncing around or any bumps in the road. The adjustable calf rest allows your baby to stretch out her little legs. The five-point harness with padded buckle ensures your baby’s comfort as well as safe riding. All these features make the riding enjoyable to your little passenger. The one hand features make this stroller more convenient to the parents.Recline, fold, stroll or store whatever you need to do, just a simple press of a button done the job. The peek-a-boo mesh window allows you to check your little traveler while out and about. The one-hand folding feature allows you to fold the stroller effortlessly and compactly. The self-standing folded stroller and auto lock features make the stroller more convenient when travelling with it. Extra large, east accessible storage space and rear storage zipped pocket gives you the option to carry all your things that you need while strolling your baby. The cup holder allows you to hold your coffee cup within your arm’s reach. The lockable front swivel wheels and the rear wheels make your strolling easy through any terrain. All these features make this stroller a perfect companion for busy parents. The padded buckle is bulky and delay the adjustment process-By removing the padding from the harness you may solve the issue. Overall, a sturdy and durable stroller that carries your baby from infancy through toddlerhood. If you’re looking for a high-end stroller at a very reasonable price, then why not trying the Baby Trend Rocket stroller? Featuring with a comfortable grip handle, five point harness, large storage basket, adjustable canopy, one-handed folding mechanism, this stroller is ideal for your on-the-go lifestyle. All these features make strolling with your baby a breeze. Overall, a great product in this price range. To fulfill all your basic needs while on the go, Summer Infant 3D lite Convenience stroller is the best option. It comes with all the features that you won’t often get at this price. The great size canopy blocks the harmful rays of the sun and thus save your little one. All these features make riding comfortable and safe for your baby. The handles are at a very comfortable height. So, you don’t need to bend over to push it. The carry strap allows you to carry around the folded stroller. All these features make it an “on-the-go doing errands” stroller. Ideal for carrying through the airport or on the subway. The CONS are definitely ones that you can just work around. Overall, a GREAT stroller to go anywhere anytime. If you’re tired of a bulky baby stroller and are searching for a lightweight stroller option, Besrey BR-C7000S Lightweight Baby Stroller can be a great choice for you. This stroller comes with all the must-have full-size stroller features that make it the most travel-friendly stroller. The padded cushion and 3position reclining seat ensure your baby’s comfort riding. The seat reclinesin an almost flat position which is great for your baby’s nap-on-the-go. 5 point harness allows your baby to ride in safety. The large size canopy provides 70% coverage to protect your baby from sun rays and light rain. One hand folding mechanism allows you to fold the stroller in two steps with just one hand. 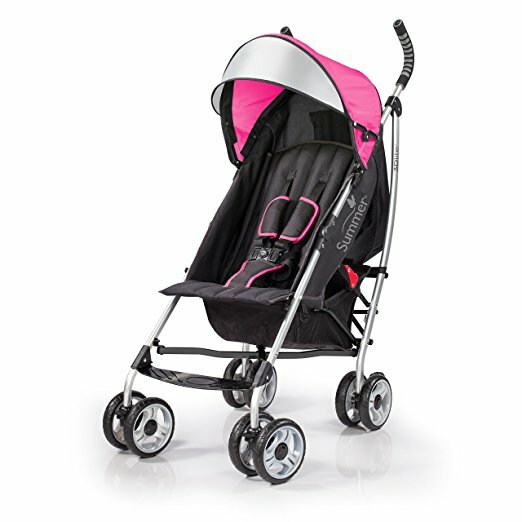 The lightweight and compact features make the stroller perfect for car travel and shopping. The folded stroller is self-standing and carry strap is convenient for mom-on-the-go. Super lightweight, but high hardnessaluminium alloy frame makes the stroller perfect for running small errands around town. The 360’ swivel wheel allows the parent to steer the stroller easily from different directions. Obviously, a travel-friendly as well as a budget-friendly baby stroller. If you’re looking for a stroller with lightweight design, but heavy with features, Graco Verb Click Connect Stroller is the best option for you. The stroller comes with plenty of convenience features to keep your baby as well as you safe and happy. You’ll appreciate all of its great features like infant car seat compatibility, multi-position reclining seat, locking front swivel wheel, parent’s tray, child’s tray, large storage basket and so on and all these at a very affordable price. The multi-positionreclining seat allows your baby to change the position his/her preference and thus keep your baby comfortable all the way. The built-in suspension system ensures a smoother and more comfortable ride on all terrains. 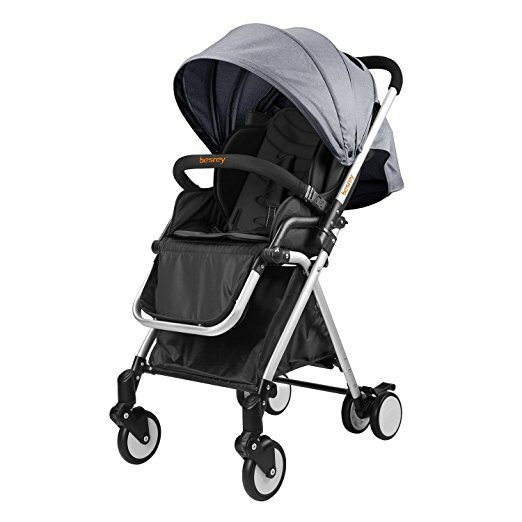 Lightweight and stylish design allows you to use the stroller for a visit to the park, shopping and so much more. The front swivel wheel provides you super maneuverability indoors and out. Lock the front wheel for increased stability and safety. Enjoy the riding with your baby with the parent tray with cup holder. Turn your stroller into a travel system with all Graco Click Connect infant car seat. Lack of shade. The short visor doesn’t do much in the way of the sun or weather protection. Surely, this stroller will impress you with its great functionality. Designed for busy parents, this stroller is a great, lightweight option also a GREAT stroller for the money. Make every stroller trip enjoyable with Graco Verb Click Connect Stroller. Usually, double strollers are more expensive than single strollers. Find out a duo stroller under budget and really a very challenging task. But you don’t need to spend a lot of time searching a cheap double stroller. 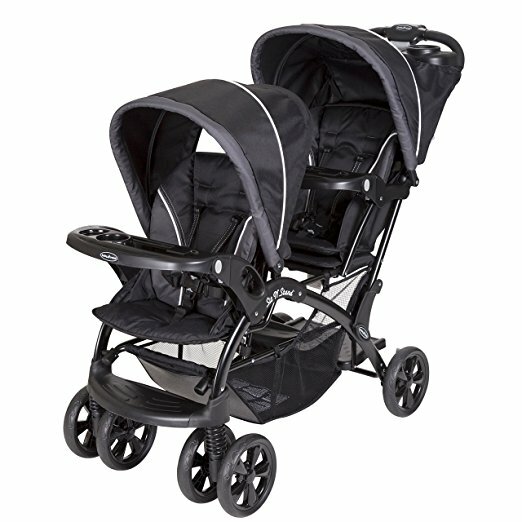 We’ve listed some well-featured creative design budget-friendly double strollers to choose from. 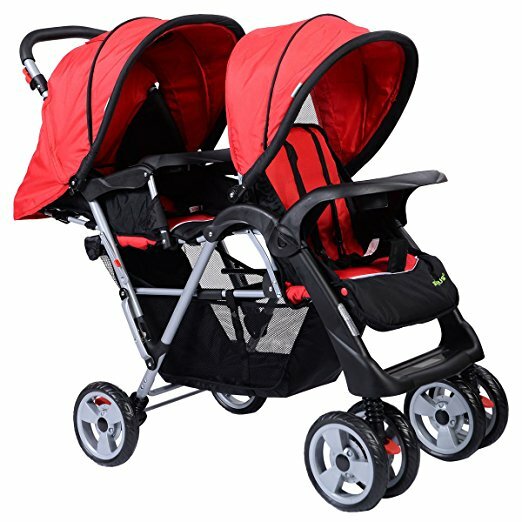 Right now, if you’re in the market for a double stroller and if you’re on the budget, then why not take a look at the amazing stroller Costzon Baby Double Stroller Foldable Kids Infant Pushchair Twin Seat Travel? Equipped with safety belt the comfortable seats are suitable for babies to sleep, rest or wonder. The more convenience foldable design allows you to store and carry it easily. This stroller will give you a great strolling experience with two babies. Overall, a wonderful stroller! Read full review about Costzon Double Stroller Foldable Kids Infant Pushchair Twin Seat Travel. If you like to stroll with fashion, Graco DuoGlider Click Connect Stroller is just the right choice for you. The stroller comes with all the essential features that meet the needs of a growing family. The stroller is suitable for not only twin, but also great for newborn and toddler. The stadium-style seating allows the child sitting in the rear raised for a better view. Both the seats arereclinable that keep both the passengers a comfortable while riding. Recline the rear seat completely flat when the baby needs full rest. Individual canopies and footrest allows you to set up according to their preference and choice. Turn the stroller into your own travel system with any of theGraco Click Connect infant car seats. Itaccepts two Graco infant car seats. Folding is now effortless with its one-hand, standing folding mechanism. The extra-large, easy-access underneath basket allows you to use it without disturbing the rear child. Standing fold with automatic storage latches folds easily, leaving one hand free for baby. Not bulky like other double strollers. A functional great stroller for a reasonable price! You should like the versatility provides by this stroller.Read Our Full Reviews About Graco DuoGlider Click Connect Stroller. If you’re looking for cheap double strollers that will meet not only the needs of a growing family but also give freedom of riding with your little passengers, then why not Baby Trend Sit and Stand Double Stroller. Featuring with multiple riding options, this stroller allows one child to sit in front while one in the rear seat can sleep, sit or stand as his/her choices. Durable constructions along with a lot of great features like car seat compatibility, five point harness, full-size canopies, foot activated rear brake makes this stroller ideal that creates a comfortable and safe environment for both the parents and children. The removable rear canopy allows your child to stand on the rear platform. The 8” front and rear wheels with EVA tires ensure a smooth and comfortable riding to your babies. Parent enjoys the freedom of choice seating configurations that suit their needs. Whether you’ve two twins using car seats, or an infant and an older child configure the seat as your family’s individual needs. Foot activated rear brakes are simple to use and allow parents to stop the stroller comfortably. A large underneath storage basket holds everything that you need while go out with babies. Covered parent organizer with 2-cup holders allows you to keep your tiny essentials and drink handy. The trigger folding mechanism is fast and easy that allows you to fold the double stroller in a compact size. Front/Rear Seat: Travel system compatible or child sitting upright to 40 lbs. Jump Seat/Standing: 2.5 years or 40 lbs. This is a perfect stroller to move out with more than one child. Best for long walks that match your lifestyle and budget. 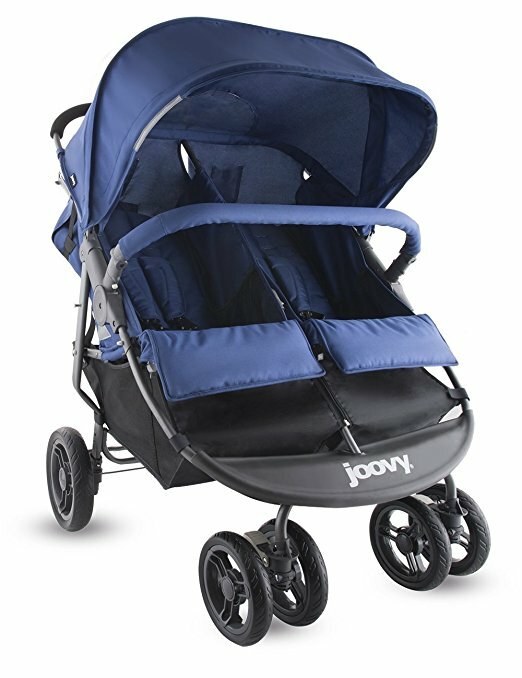 If you’re a parent of twins or siblings of close age and are searching for a cheap double umbrella stroller for a simple stroll to the playground to a day adventure, the Joovy Scooter X2 Double Stroller is the best pick for you. Side-by-side narrow design along with all other excellent features like larger seals bearing wheels, large canopy, individually reclining seats, large storage basket, mesh storage pocket, one-handed fold is sure to keep both your little passengers and you cool and comfortable. Each seat features reflective five point harness that ensures your child safety even in low light. The stroller comes with a divider between the two seats, which make it easy to keep the little ones poking or punching each other. The Larger wheels ensure a satisfying smooth ride to your kids. The larger 7” sealed bearing front wheels and 9.5” rear wheels give you great maneuverability and makes it easy for parents to push two kids totaling 90 lbs. Featuring with the lightweight design and 30” width, the stroller fits through any standard doorways while providing a roomy seat for your baby. You don’t need to fold the stroller to get inside a door. The storage basket is larger than any other stroller basket available on the market that provides ample storage to keep everything you need. Two large zippered pockets allow you to keep safe your valuable belongings. One-hand folding takes just seconds and the folded stroller is compact enough to fit in most trunks. In spite of few downsides, the stroller is one of the rich featured cheap double strollers that will make each trip a delight for you and your little ones. A high quality, affordable stroller ever! If you wish to take your babies along with daily activities around the town or running along a trail, then Baby Trend Expedition is the ideal way. This stroller is designed to tailor to the needs of multiple babies. 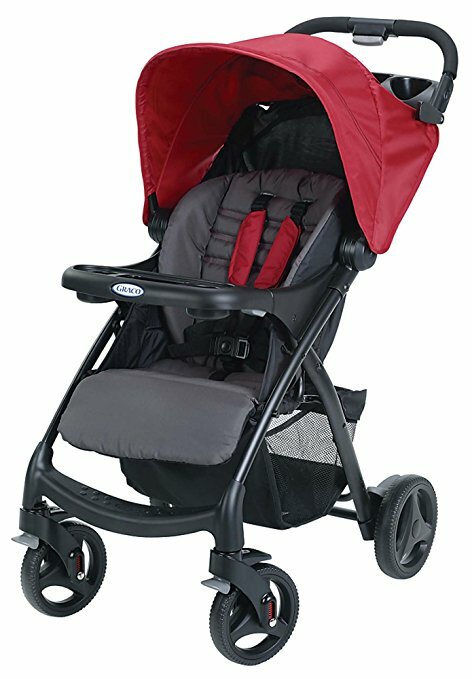 Featuring with all-terrain pneumatic tube bicycle tires along many other great features like lockable front swivel wheel, foot-activated rear brake, multi-position recline seat, 5-point safety harness, covered storage compartment and Parent tray with 2 cup holders, this stroller is really a perfect travel companion of buzy parent. 16’ rear and 12” front wheels with pneumatic rubber bicycles tiresprovide a smooth ride to your baby in all-terrains. Multi-position reclining padded seat withfive point harness ensures comfort and safety of your little passengers. The seats recline independently and almost flat position. The foot activated rear brake allows you to stop the stroller quickly and easily when you need. A lockable front swivel wheel makes the stroller easy to maneuver. Lock the wheel for added stability while jogging or running, and unlock it when you’re just walking. Folding the stroller is quick and easy with just one hand. The large covered storage compartment allows you to store everything for convenient use on the go. Overall, a great stroller for busy families on the go. 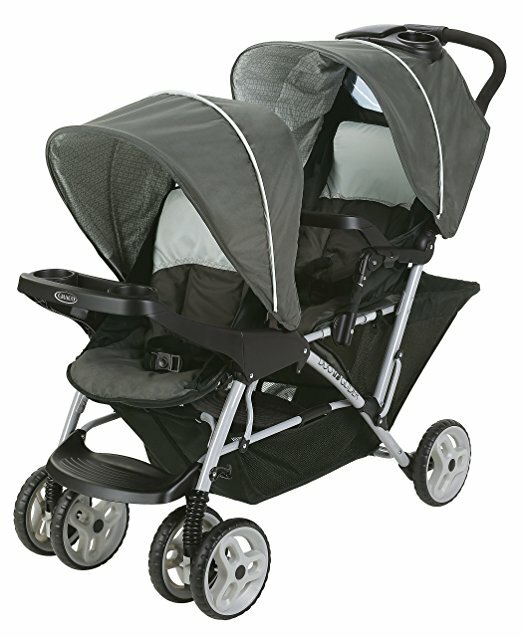 Enjoy durability, luxurious ride and all-terrain versatility with Baby Trend Expedition double stroller. 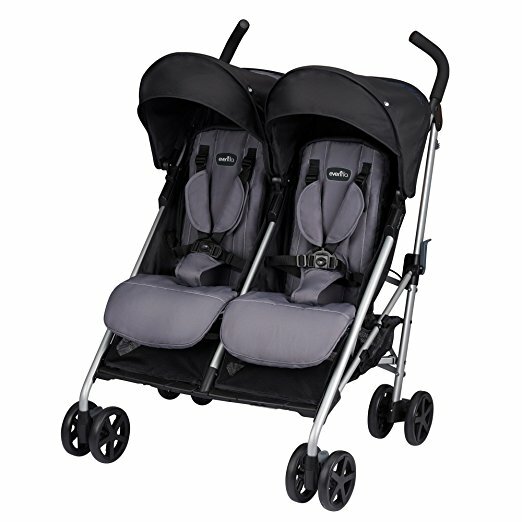 To enhance your happy parenting experience, bring the luxurious featured Evenflo Minno Twin Double Stroller today. Featuring with a narrow design, this stroller allows the parent to take both babies out for running errands or strolling in the crowded place. The stroller comes with all the great features including large storage basket, oversized canopy, parent cup holder and the unique one-hand, self-standing folding mechanism. The individually reclining seat ensures thecomfortability to your children while on the go. The oversized canopy keeps your baby full shaded on a sunny day. Folding this stroller is very easy and you need just one hand to do the job. The compact and self-standing folded stroller is hassle-free to transport. The rear accessible, generous storage basket provides you ample space to store all the essentials. The crossbar near the handle is suitable forhanging shopping bag, a diaper bag and more. Overall, a full functional stroller at a very affordable price. Don’t be overwhelmed with tons of features. Choose the stroller from our list having convenience features and style. Surely, you’ll enjoy all the necessary as well as the great feature of a high-class baby stroller like tall-handlebar, great coverage, convenient storage option and even a reclinable seat and all in a affordable price. Compromise with the price, but not with your baby’s comfort and safety.